Eiko & Koma had a wonderful 17th summer at the American Dance Festival (ADF). The concert featured a new work Raven as well as their oldest work White Dance seen for the first time at ADF. 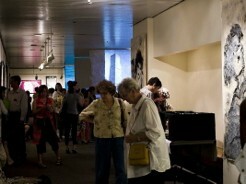 Eiko & Koma created an exhibition in the lobby with several video installations. Please visit the ADF website for an interview with Eiko & Koma.